It is sad but I only have a few photos documenting my childhood. This is the only photo I know of from which an enlargement was made, a rarity outside the annual school photo. My parents were just not photographers. 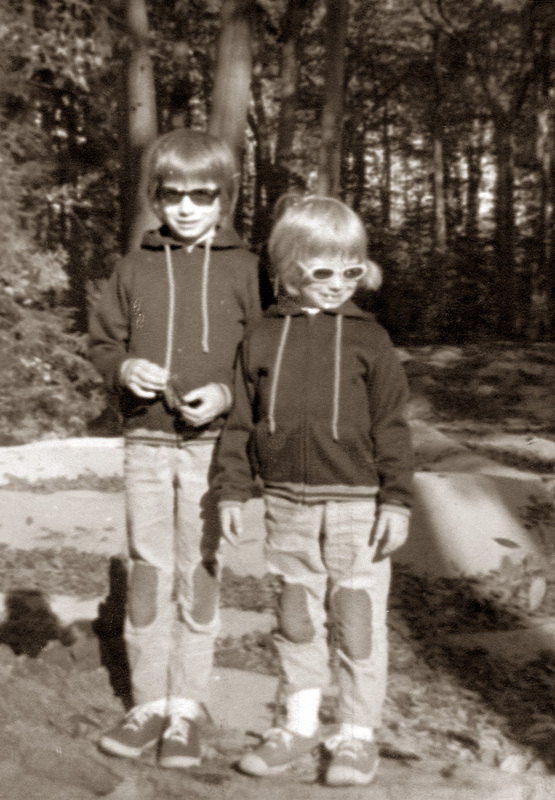 This photo of my sister and me was taken in Waukazoo Woods behind my Uncle Denny’s house, near where my dad and grandfather were working on one of the many homes they built. My sister and I, who are almost 5 years apart, were dressed as usual, like twins. I am not sure why my mother did that, and I am even less sure why we did it without complaining! I think that I was about 9 years old, and I remember this day, it was autumn and the sun was so bright, there was a subsequent photo where my mother made us take our sunglasses off and my sister and I are squinting madly. This was the much nicer picture and here we are in faded and patched jeans and zippered sweatshirts marking this time for all history. Sadly, Waukazoo Woods no longer look like this nor do my sister and I. However, I remember this day and the beauty of the woods with its majestic beech trees. By gone days of childhood that are long gone, but not forgotten.